NordicTrack GX3.0 Exercise Bike is a budget exercise bike that is very suitable for professional fitness enthusiast. It is designed elegantly to to give you the feel of real cycling outdoors. It has a chain drive system and a natural felt resistance system for a real feel. Beside this indoor bike has many other attractive features like padded saddle seat, non-slip multi-position handlebar, water bottle holder etc. Its simple start and stop functionality helps you for a comfortable workout. *Note: Most of the sites, stores or shopping portals listed above sell NordicTrack GX3.0 Exercise Sport with discounts and other exciting offers. There is a possibility that the some of above websites are not selling NordicTrack GX3.0 Exercise Sport now. Toughtrain.com is not liable for such cases or instances. 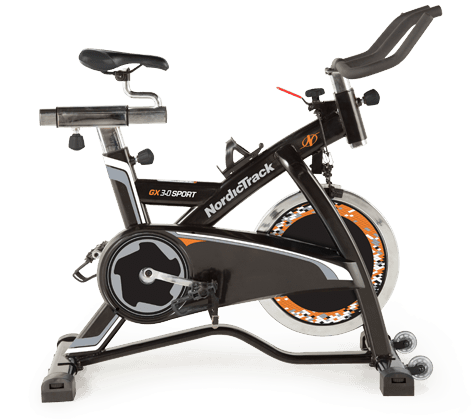 Also we do not recommend any seller for NordicTrack GX3.0 Exercise Sport and a buyer should buy from where he/she gets best deal with quality of products, service and on time delivery (shipment).